I got the news this morning that screen icon Christopher Lee died at age 93. Sir Christopher loomed large in my childhood, being the fan of “monster movies” that I was (and very much still am). 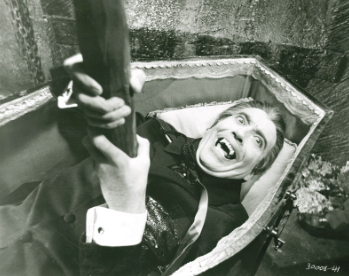 In fact, it was a Christopher Lee film, Dracula has Risen from the Grave (1968) that was my first horror movie experience at a theater (the Halstead Drive-In in beautiful Riverdale, IL to be exact). I actually had the opportunity to meet Mr. Lee at a horror movie convention in Baltimore some years ago. In fact, many of the cast of those venerable Hammer horrors were there. (I also spoke with Freddy Francis who directed “Has Risen” – and who later won an Oscar as director of photography for Glory.) Great stuff. Our first ever edition of Famous Monsters of Filmland magazine. One of the cover stories was “Dracula has Risen from the Grave” – which made both my brother and I life-long Christopher Lee fans. It’s bittersweet to see one of your childhood icons die – bringing back a flood of shadowy memories and the larger-than-life experience of being so properly scared. Of course, there was also a magic in it back then, likely due to the fact that I was only 7. 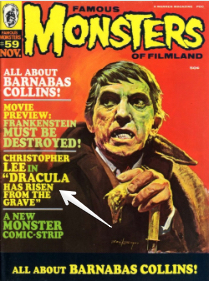 Ah, the likes of Famous Monsters of Filmland magazine featuring Lee/Dracula (and also Barnabas Collins from Dark Shadows!). Or Creature Features on WGN-TV at 10:30 every Saturday night. All of it was…. GREAT STUFF!!!! Thank you Sir Christopher, for all the great moments you gave us (from Dracula to Rochefort to Dooku to Saruman)! God bless you and your memory, and may you rest in peace. In sharp contrast to the utter drek I chatted about in my last blog, I think that Tender Mercies (1983) is an utter masterpiece. Sadly for most of the viewing public, the movie didn’t do very well at the box office. A shame – this is a film that deserves to be seen. The sparse landscape, sparse performances, and sparse mood all add up to something majestic. The very definition of “less is more”. Robert Duvall (who, by the way, is a god) plays a once big country singer, Mac, who has boozed his way out of the limelight. Duvall’s stoic performance just oozes the pain, regret, and often senselessness of Mac’s life out of every pore. Yet he still manages to give Mac a dignity that makes us stay right there with him. As he did in To Kill a Mockingbird (with a screenplay by the same writer, Horton Foote, as this film), Duvall says more with hit eyes than most actors can accomplish with even the best lines of dialogue. And then newcomer, Tess Harper, is so completely believable as Rosa Lee – a country girl, sheltered from much of the world but not ignorant to it. She has a quiet wisdom about her; a grace if you will, that mesmerizes. I saw this movie when it opened and was nearly dumb-struck by it. The effect – now 32 years later – has not worn off in the slightest. I won’t go into the story at all here. Better that you make it your mission to see it. In that way, the tender mercies – found in this film in abundance – will be bestowed upon you as well. I saw Hot Pursuit based on a review in The Guardian. Although I’ll still read the online version of this newspaper, I’m not likely to read their movie reviews anytime soon! The review intrigued me in that while it stated the movie wasn’t very good, it raved about the on-screen chemistry between its two stars, Reese Witherspoon and Sofia Vergara. Witherspoon is a fantastic actress whose work I’ve admired since she was a kid in the very touching The Man in the Moon (1991). And Vergara steals the show in Modern Family – a modern-day Lucille Ball. So when I read how these two worked so well together, I thought I’d give an admittedly dumb movie a chance in order to experience the on-screen magic. All I saw was a pathetically idiotic film that didn’t need to be made. Now I can put up with dumb comedies as long as they’re funny (Mortdecai being a prime example). Alas, watching this film, I barely even cracked a smile once – which means that all I saw was a really dumb movie.